Do you love to explore the outdoors with Google Maps but sometimes wish it had the details of a trail map or a tourist attractions map of a foreign city? Do you sometimes wish you could take one of those “You are here” maps with you to help you find places in an unfamiliar environment? Do you prefer maps on your phone rather than on paper? If you answered “yes” to even some of these questions, you may want to take a closer look at a new Android app called Custom Maps -- recently released as open source at code.google.com. 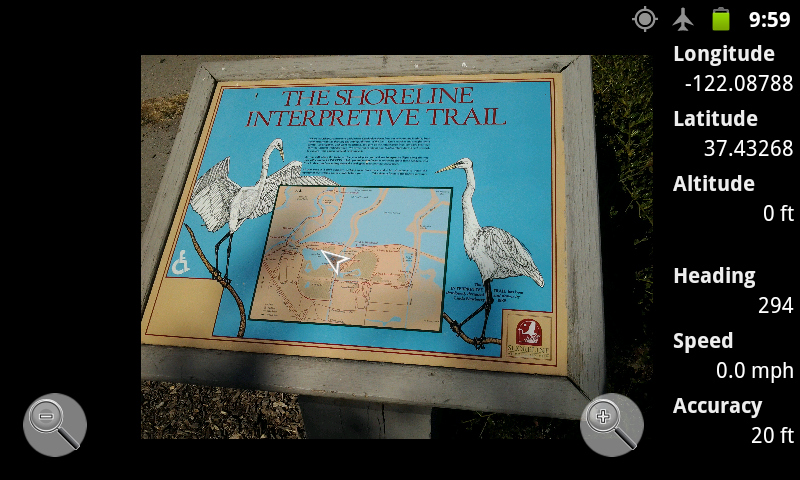 Custom Maps showing a birdwatcher’s location overlaid on a photo of a posted park map. 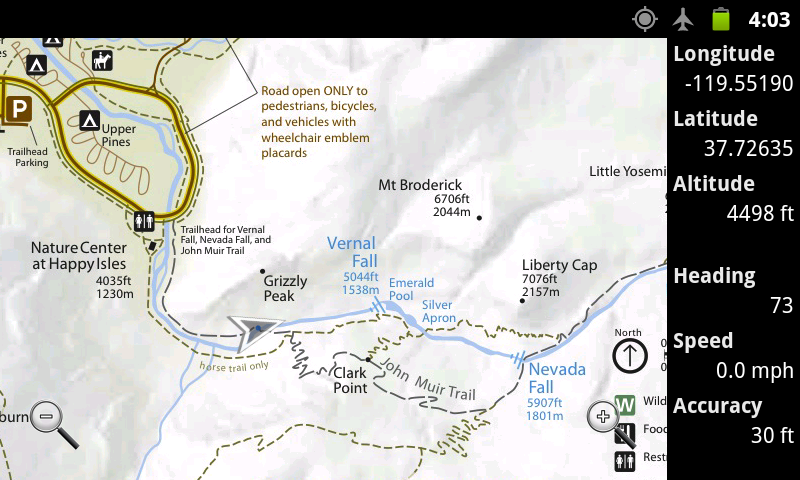 The Custom Maps app allows for easy creation of digital maps from any map image. The image can be a photo of a paper map, a photo of a brochure map, or a picture of the map posted at a trailhead or at the entrance to an amusement park. It could also be a .jpeg or .png image hosted on the internet or a screenshot of a PDF map. All you have to do is choose two (or more) matching points that are common to both the map image and Google Maps, and Custom Maps can show your GPS location on the map. This makes it an excellent mapping option in situations where data signal is not available like in state parks or abroad, or when alternate map images show details that are not included in Google Maps. 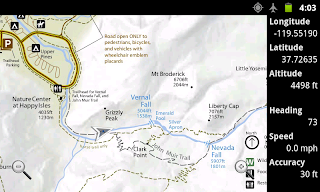 Custom Maps showing a hiker’s location on Mist Trail in Yosemite National Park. Custom Maps stores the geo aligned map images into KMZ files, which are simply ZIP files containing the geo location information in KML format, and the map image file. This makes it possible to take the map image out of the KMZ file, add some personal markup in the map using an image editor, and put the image back into the KMZ file. As long as the image is not resized in the process, the marked up map image can now display the user’s GPS location. Custom Maps users can share created geo aligned map images as email attachments or by using QR codes. When a Custom Maps compatible QR code is scanned by a barcode scanner application, users can open the link directly in the Custom Maps app instead of a web browser. But Custom Maps is not finished yet. Several new features are planned including distance measurement, marking map locations with icons, making it possible to geolocate map images without Google Maps or data connection, working around the app memory limit to load larger map images, and automatically switching between stored maps based on user’s location and zoom level. Join the open source project to add these and more features to Custom Maps.